SCVHistory.com LW3491 | U.S. Camel Corps | Postal Cover: Revival of the Camel Express, Lilac Label, 1935. 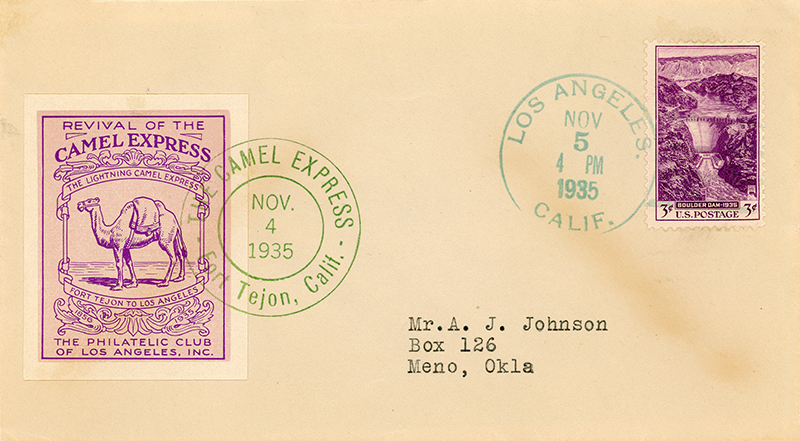 Postal cover: "Revival of the Camel Express," lilac label postmarked Tejon, November 4, 1935; franked at Los Angeles (Hollywood) by postmaster H.B.R. Briggs on November 5, 1935. Boulder Dam 1935 stamp, 3c postage. Billed as a reenactment of the use of camels by the Butterfield Overland Mail Co. in the 1860s — alternately as a reenactment of Edward F. Beale's use of camels to carry mail from Fort Tejon to Los Angeles in 1856 — a little caravan of three camels from the Goebel lion farm near Camarillo carried 7,000 pieces of mail on an overnight journey from Fort Tejon to Hollywood along the Ridge Route, passing through the Santa Clarita Valley and Cahuenga Pass. Led by costumed camel jockeys, the caravan departed at about 11 p.m. on November 4, 1935, and arrived just before noon on November 5. Reporters made the point that air mail would have shaved about 12 hours and 20 minutes off of the 13-hour trek. The event was orchestrated in observance of National Stamp Week by the Philatelic Society of Los Angeles, founded in 1927 and incorporated just days prior to the expedition on October 16, 1935. The society issued three types of covers (lilac, orange or green labels). Proceeds went toward a newly organized Philatelic Library, which at one time contained more than 6,000 books and periodicals covering all manner of philately but ended up having a troubled history as it moved around from place to place in the Los Angeles area and finally shut down for good in the 1990s. Briggs, the postmaster, predicted that the postal covers would be worth $10,000 in 150 years. The original sale price was 50 cents. At the current rate of appreciation, 300 years would have been closer to the mark. 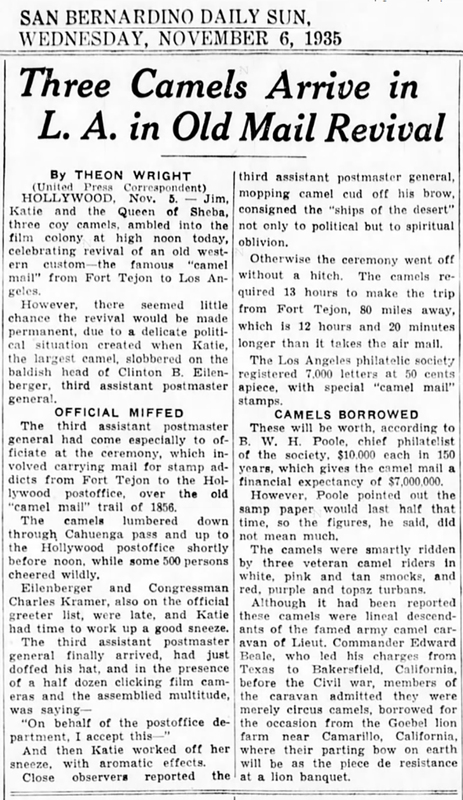 Looking back, the only real trouble with the philatelists' camel "revival" was that it commemorated an event that never happened. Yes, camels came through the Santa Clarita Valley back then. And yes, Beale had something to do with them. But the Butterfield Overland Mail operated in California from 1858-1861 and didn't use camels. There weren't any camels at Fort Tejon in 1856, and when there were, they didn't haul mail. The camels arrived at Texas in 1856 and 1857. In the latter year, the Congress authorized and the Army awarded a contract to Mexican War veteran E.F. Beale to survey and build a wagon road along the 35th parallel from Fort Defiance, New Mexico Territory, to the Colorado River on the California-Arizona border. Beale was ordered against his wishes to take 25 of the camels with him. So many fables. Indians didn't kill and eat all the camels. On the other hand, Confederate soldiers did kill some of the camels they captured in Texas because they were a nuisance. The surveying expedition set out June 25, 1857. Beale eventually warmed to the camels, which stood up to the rigors of the Southwestern desert as they had done in the Middle East. They reached the Colorado River October 17, 1857. Beale then moved the camels to the La Liebre Ranch in Kern County which was owned by his business partner, Samuel A. Bishop. (The following decade, when he dug out "Beale's Cut" in Newhall, Beale owned the La Liebre Ranch and folded it into his vast Tejon Ranch.) The only time the camels actually saw combat action was when Bishop, a civilian, used them to rout an attack by a band of Mohave Indians. In April 1858, Beale took a different set of 25 camels with him when he surveyed a second route along the 35th parallel from Fort Smith, Arkansas, to the Colorado River. It took him about a year. In November 1859, the Army moved Beale's original 25 camels (and three more; they had gone forth and multiplied) from Bishop's farm to Fort Tejon. They weren't used for anything there and were moved in March 1860 to a grazing area 12 miles from the fort. Then in September 1860 the Army decided to see whether they were any good for carrying mail. They weren't. Twice they raced 300 miles from Los Angeles to the Colorado River against a standard express team consisting of a two-mule buckboard. Both times the camels died from exhaustion. They were good for stamina, not speed. This was the first of only two times they could be said to have carried mail, and it was a failure. In early 1861 the Army used four camels in a survey of the California-Nevada boundary. Another failure. On February 28, 1861, Confederate troops captured Camp Verde, the Texas headquarters of the so-called U.S. Army Camel Corps. The rebels used the animals to carry salt and mail around San Antonio. This was the second time they were used to carry mail — but not U.S. mail, and not in California. Meanwhile the camels that had been left at Fort Tejon were transfered to Los Angeles on June 17, 1861. They grazed and bred there for three years, doing little else as they were transfered from post to post. There were proposals to use them for mail service, but no such proposal was adopted — for good, proven reason. In 1864 the Army sold off the camels at Los Angeles, and in 1866 it sold the recaptured camels in Texas. Some went to circuses, some to private ranches, some to miners and prospectors. 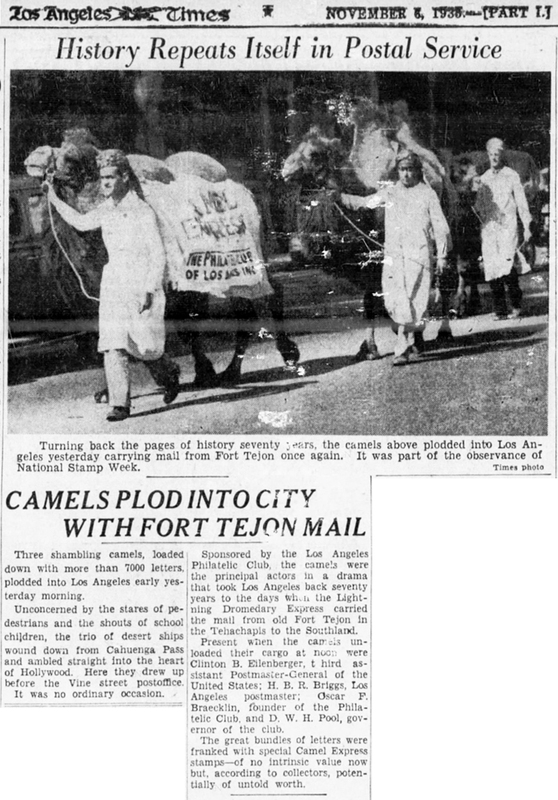 The last of the "pretty much for sure" original Army camels, named Topsy, died at Griffith Park in Los Angeles in April 1934. 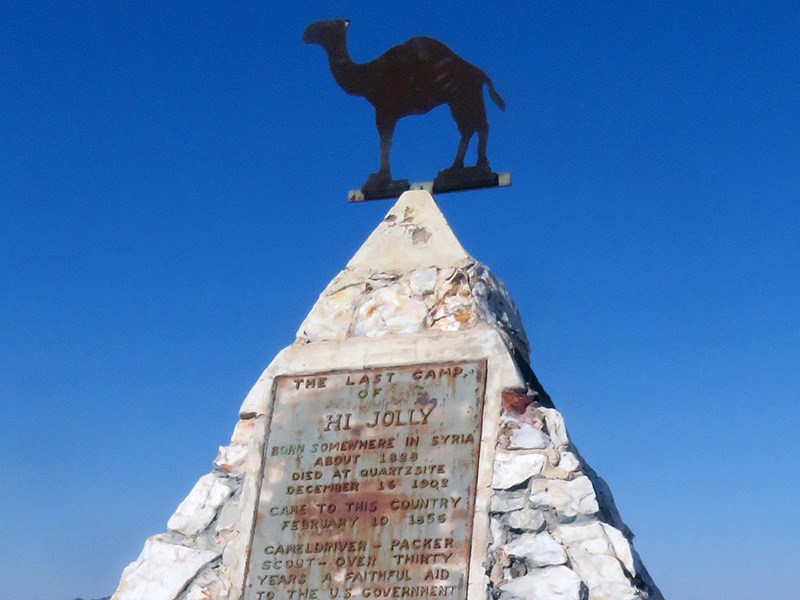 The following year, the Arizona Highway Department erected a pyramidal tomb in honor of Haiji Ali, aka Hi Jolly, the Army's Syrian camel driver of the 1850s-1860s. That same year, stamp collectors in Los Angeles commemorated an event that didn't happen. But they probably had fun. Principal source of U.S. Camel Corps information: The Army Historical Foundation — the organization tasked with financing a future National Museum of the Army at Fort Belvoir, Va., outside of Washington, D.C.
1. Santa Maria Times, November 6, 1935. 2. United Press wire story as published in the San Bernardino Daily Sun, November 6, 1935. LW3491: 9600 dpi jpeg from original cover purchased 2019 by Leon Worden.